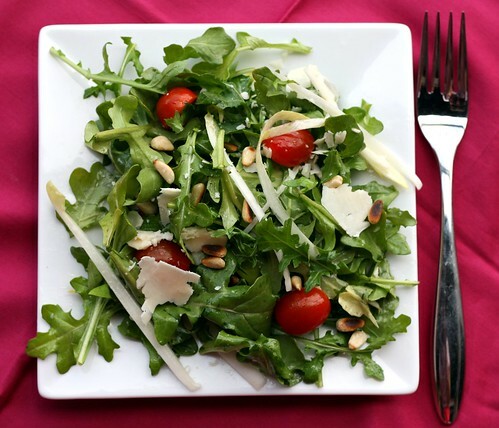 Arugula and Endive Salad with Pine Nuts and Parmesan – Elly Says Opa! Tom basically thinks arugula is the best thing since sliced bread (actually, he likes arugula way more than sliced bread). He prefers I only use it raw so that it retains all of its peppery bite. I love it, too, so I can’t say I blame him. In a small skillet, toast the pine nuts over medium-low heat, shaking the skillet occasionally, until golden and fragrant, about 4 minutes. In a large bowl, combine the olive oil with the lemon juice and season with salt and pepper. 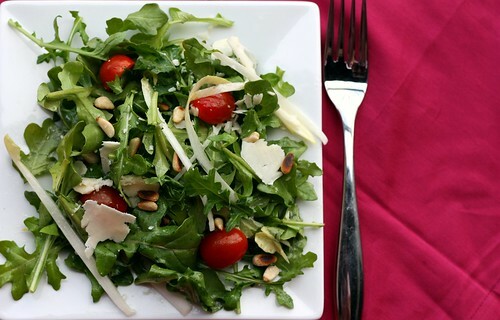 Add the endive, arugula, tomatoes, Parmesan cheese shavings and the toasted pine nuts and toss thoroughly. Serve immediately.